We’re easing back into the school week…one of the children asked if it was home time at 9:30 am on Tuesday morning so we knew right away our return to class should be gentle, patient and unhurried. We need to adjust our teaching so we can meet as many needs as we can. The longer we teach, the more we know that listening and observing the little cues and signals from our children is vital to understanding where they are in their self-regulation. We know that if the biological needs of food, thirst and sleep are not met, the children cannot self-regulate. The same can also be said for the emotional need of knowing their teacher will care for, and look after them during their school day. From the moment the children enter the classroom each morning, our attention must inspire confidence and trust so they can continue with their number one job: to play and learn. We’ve allowed for extended Centre Time every morning this week. Many of our children are quite tired from travel, and being out of their regular home and school routines and schedules from the holiday. They’ve missed their friends and need the time to be able to re-connect, play and chat. We’re observing many positive social interactions around the Lego table and in the House Corner, and this has led to sitting with new friends at snack and playing in bigger groups on the playground. -please wait outside your child’s classroom (for Mrs. Daudlin, please wait outside the school building) until the 8:50 am bell rings. -this month we are making it our goal to pick up all food from the floor after we eat at recess and lunch. Sometimes children are so busy talking at lunch they are not mindful of their eating habits. We do not wish to create any extra work for our school custodians so we will be vigilant about cleaning up after ourselves. -our line-up when we go from one place to the other were very chatty before the holidays. Children should stand quietly with their mouths closed, hands to self, as they wait for teacher instructions. You might be following the NCAA College Basketball March Madness tournament, but we are in a Final Four of our own…Alphabet letters, that is! It’s a very exciting time for everyone as we anticipate completing our instruction of the Alphabet sounds and letter formation by the end of April. We will continue to focus on phonological awareness (the sound structure of language, including sounds (phonemic awareness), rhyme, syllables and words) as we build the solid foundation of oral language skills the children need to have before reading and writing. Click here to read our extensive post on phonological awareness as part of a balanced approach to reading instruction. 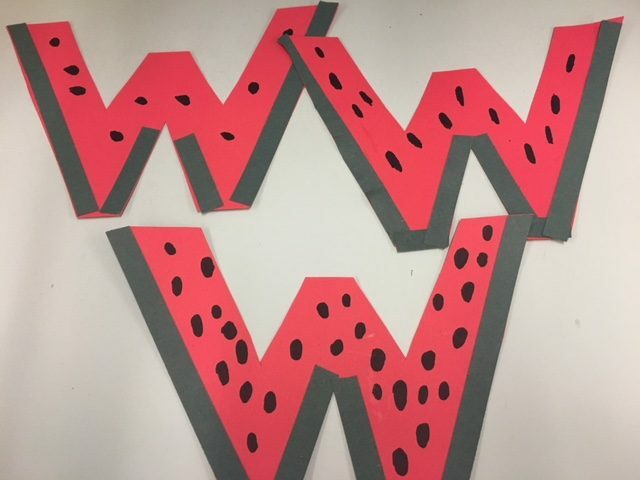 This week we worked on the letter “w” and made these adorable watermelon w’s. Our West Vancouver Physical Literacy team came by this week to see how the children are developing in their physical literacy skills. Walking, running, skipping, hopping; backwards toe-to-heel walking; kicking and throwing were observed. We were really pleased with how the children listened and performed the required tasks. We ask you to please check the food you send to school, particularly shared food such as birthday treats. Read the label every time. If in doubt, please speak with your classroom teachers. Sharing and Special Helper theme is “Collections.” We still have another week to go before we start our next theme. Kindergarten Vision and Hearing Screening by Vancouver Coastal Health Public (VCH) School Nurses takes place on Wednesday, April 25. Please try to be present at school. Parents will receive the screening results shortly afterwards (usually within a week). Save the Date: Student Led Conferences for Kindergarten will be held on Thursday, April 26 from 2-4 pm or Friday, April 27 from 8:15-8:40 am. There will be a sign-up sheet posted for you to enjoy a Conference led by your child about the work we’ve completed in class. In Kindergarten, our Conferences last for 25 minutes so please be aware of this if you sign-up for multiple conferences as our schedule will differ from the rest of the school. Conferences are a very special time for just the Kindergarten student and parent(s) so please make arrangements for siblings if possible. -Scholastic Book Orders for April are due on Monday, April 9. We sent home the Student Flyers before Spring Break, or you can go to http://www.scholastic.com to view them. 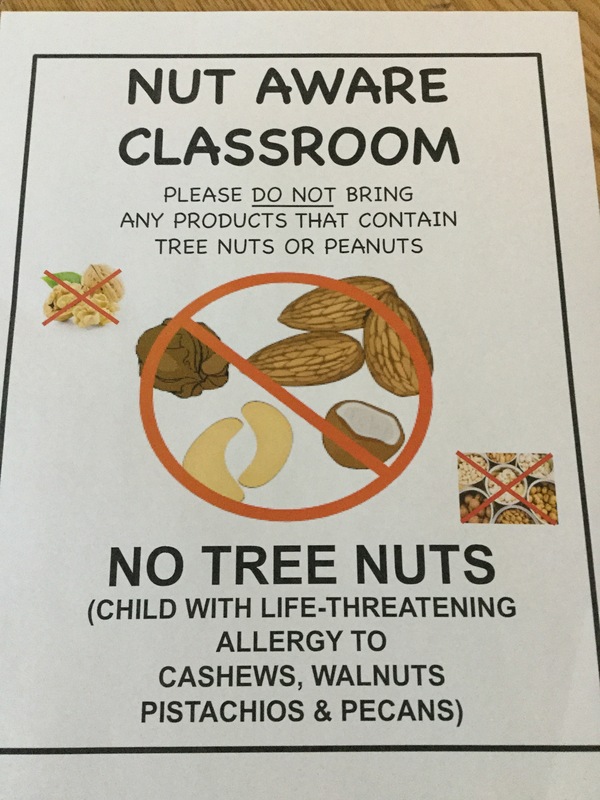 If you decide to order online, please let your teacher know. -Report Card envelopes for Second Term. We will re-use these for the Third Term Report Cards. -March Homework Calendars are due. Return your calendar for a sticker!